As I’m very late to the party reading this beautiful book I don’t need to say much more than that. I’m sure you’ve all read at least a half-dozen glowing reviews of it (and if you haven’t, check out Norman’s which is my favourite) and I doubt there’s anything new or interesting I can add to the discussion so I shall just muse. My first thought is how annoyed I am at the hype machine that publishing has turned into. I am repulsed by hype. I don’t mean sickened (though sometimes…) but rather the put off/driven away meaning of the word. If a book is being read by and gushed about by everyone then I don’t want any part of it. Mostly because books – even good ones – can rarely live up to the expectations set by such ubiquitous adoration but also because even if a book is that good there’s a reasonable chance I won’t like it. I am often out of kilter with the popular zeitgeist (I threw GONE GIRL at the wall for example). My aversion to hype meant I didn’t read this book for ages and nearly didn’t bother at all. My second thought is borrowed from my favourite radio show/podcast (BBC Radio’s flagship movie review show). There’s a running theme on the show that movies are often not about what they appear to be about on the surface (so Jaws isn’t really about sharks and Tinker Tailor Soldier Spy isn’t really about spying and so on). In the same vein NORWEGIAN BY NIGHT isn’t really about a crime. Or criminals. Instead it is about ageing and masculinity and fatherhood and grief and the heroism of ordinary people and the hidden cost of war. My favourite kind of ‘crime’ novels are the ones that make a mockery of genre labeling and this one positively breaks all the barriers. My third thought is that whatever else you throw into a book if give me a character who makes me laugh you’ve won a special place in my heart. Although I only met him a couple of weeks ago I can foresee that the novel’s hero, 82 year old Sheldon “Donny” Horowitz, will become one of my all time favourites. He is my idea of a perfect character. That doesn’t mean he’s a perfect person but that’s kind of the point. He’s just an ordinary bloke dealing with the hand life has dealt him with the kind of active practicality that I associate with men of his generation. And he does it with a laconic humour that made me laugh more than enough to offset the occasional tears. I love everything about this book. The cracking dialogue between Sheldon and the ghost his best friend has become. Its ambiguous ending. Actually its ambiguous middle bits too. Was Sheldon really a wartime sniper? Does it matter? Its lack of predictability. Its humour and warmth. The way it manages to be a novel about the human toll of war without sounding like a zealot’s treatise (I’m so tired of being told what to think). I even love the cover. Of this version anyway. It is so rare these days to see a cover that represents a book at all let alone one that does so perfectly. I know I haven’t told you about the plot but you don’t need to know more than it’s about a man. Who does his best to save a boy. If you are one of the few people who didn’t read this book when all the hype was being thrust at you then do so now. And if you’re at all fond of audio books then by all means track down the version narrated by Sean Mangan. It’s a treat. 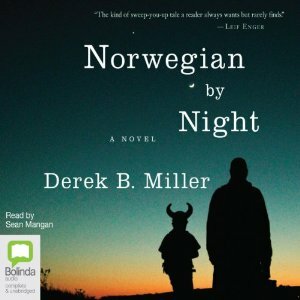 This entry was posted in book review, Derek B. Miller, Norway. Bookmark the permalink. Bernadette, many thanks for your kind comment. Two people from countries thousands of miles apart with very different backgrounds, and we seem to agree on so many things. The aerodynamics of a paperback copy of Gone Girl for example. Norwegian By Night is a wonderful novel, but I was lucky enough to meet in real life many men like “Sheldon Horowitz”. They fought, lost friends and relatives, while rarely speaking about their experiences as soldiers, and POWs. I think we need to be constantly reminded of that generation, and not throw away the world they fought to bequeath to us. Perhaps not surprisingly I agree with you Norman…we should be reminded of what that generation did for us all. My dad is 91 and Sheldon’s thought processes and action-oriented approach to things reminded me of him and his friends. Me, I haven’t read it yet either, despite all the reviews, but you’re convincing me I should. I do see the irony of grizzling about hype and then proceeding to hype a book. But it is a lovely read. And if you need more incentive a boy’s choice of clothing proves critical to the outcome of the story. Bernadette – Oh, I”m so glad you enjoyed this. And yes, I agree that Sheldon Horowitz is a great, great character. There are lots of things that made his character work for me, and the fact that he could make me laugh is definitely one of them. And yet, there’s a lot more to him than that, and that’s all to the better. This is an unusual kind of book isn’t it? But in my opinion a good one. It is unusual Margot…but in a very good way. I hated Gone Girl too. So it looks like I’m in good company 🙂 I still haven’t read Norwegian By Night but from the glowing the reviews it looks like I should. Saw The Rap Sheet giving this book away last year because Pierce loved it so much. Thanks. I completely understand what you mean about overhyped books – I also hesitate about reading those, and sometimes (only sometimes) that means I’m missing out on a good thing. I was not completely 100% enamoured of Norwegian by Night, I’ll be honest: I felt there was a missed opportunity to be even more funny, mordant, original – there were some lone ranger thrillerish elements there which spoilt it for me. But the main character is very real and funny (and irritating). Oh I agree that the book wasn’t perfect Marina…but I’m OK with that. Hopefully it gives the author room to improve for next time out. I have not read this book either but I do have it and bought it shortly after it was available. I do worry about high expectations ruining my experience, but I look forward to reading it. And your post encourages me to make it soon. I have so many books I want to read soon, though. Definitely adding this to my to-read pile. I have been thinking lately that there are just too few books with older main characters and I really want to know why (or rather, why not?). So much wisdom, so much life lived. Combining this with your synopsis that this is about a man, who does his best to save a boy – more than enough for me to want to read this! Just like in real life older protagonists make fascinating characters. What I liked about Sheldon is that he is not the typical older character – he’s neither a “get off my lawn” shouting old grouch nor a ‘everything he says must be interesting just because he is old’ kind of stereotype. He’s a mixture of those extremes and everything in between – just like a real person. Hope you enjoy it if you do get around to reading it. I really like the sound of Sheldon as a character. You’re right about those stereotypes. I’m looking forward to reading this one. I’m even more out of sync with the zeitgeist than you. I hadn’t even heard of this book until your great review! It sounds excellent though and, as an audio fan, I’ll get the Sean Mangan narration on my Audible wish list. Hope you enjoy the audio book. We are so lucky that people will read us such great stories. If I ever find my copy I’ll read it sooner rather than later…which on my timescale should mean the end of the decade. Your enthusiasm has moved it up from the 2020’s! Those tubs in the attic must be quite daunting Col. I think this might be one of those books where our individual Venn diagram circles of likes do overlap though. Bernadette: Good thing you threw Gone Girl at a wall. It probably would have smashed through a window and then you would really have had to rant. I was uncertain I wanted to read the heavily hyped Norwegian by Night but was persuaded by a recommendation from Jose Ignacio. A positive review from a blogger I respect goes much further with me than any number of fellow author testimonials. I am wary of authors ‘blurbing’ each other too Bill. It’s way too closed a circle for me. Well, I’m so glad you came to the table on this wonderful book. I loved it. I was telling passages to friends, and also relaying the humor. In addition to all of the qualities that you discuss above, the book resonated with me because it’s about an elderly Jewish character — and it’s full of Jewish humor. I laughed so hard at some points in the beginning that I was crying. And it reminded me of my mother’s Russian/Jewish immigrant relatives — the way they talked, their philosophizing, despair mixed with humor, all of it. And Derek B. Miller got it all perfectly. Now I’m thinking I should buy a copy to lend it out as I did with Visitation Street and Crooked Letter, Crooked Letter. And on Gone Girl, I won’t even read it. I don’t like its description nor its hype. This saves me from having to throw it against the wall. And I will not see the movie. spoke to another reader-friend who won’t read it either. You are not in a minority. I think I’ll have to revisit Sheldon sometime soon.